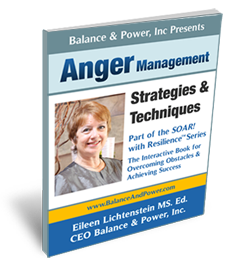 Explore strategies to reduce anger and deal effectively with others. 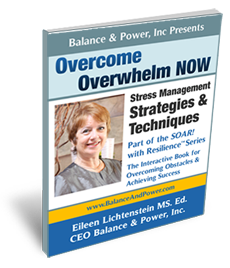 Anger and communication issues are highly affected by stress levels. Part of the "SOAR! 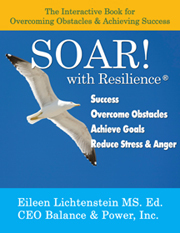 with Resilience®Series: The Interactive Book for Overcoming Obstacles & Achieving Success"
The Interactive Book for Overcoming Obstacles & Achieving Success"
Her inspiring book gives you real life examples of how she guides her clients to success through her own experiences and years of training as a successful life and spiritual coach. As if that's not enough, this amazing book is chock full of inspirational quotes from some of the top self help guru's of our time. 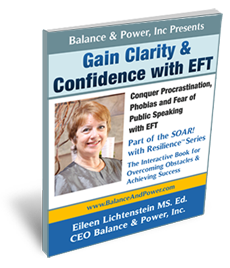 Eileen's interactive exercises that are sprinkled throughout the book are delightfully easy to follow while guiding you step by step through her process to success.